Increased seismicity occurred at Martin during 8 January until at least 15 January. About 300 earthquakes were recorded during 2 days, in contrast to the background rate of ~25 earthquakes per month since the seismic network was installed in 1996. AVO increased the Concern Color Code to Yellow. AVO reported that swarms of earthquakes of this nature are common at volcanoes such as Martin, and do not suggest that eruptive activity is imminent. Satellite data showed nothing unusual, although steaming is frequently observed at the volcano. Activity at Mount Martin volcano since our last report (March 1995, BGVN 20:03) was marked by typical activity (summit fumarolic activity, often generating thick steam plumes reaching up to 1 km above the summit; Neal and others, 2009), occasionally interrupted by increased seismicity. The most notable event was a seismic swarm in January 2006. Outstanding activity. An increase in seismicity during October 1996 was attributed to an actively degassing intrusion at the neighboring Mount Mageik volcano, ~7 km ENE of Martin (Jolly and McNutt, 1999). Other increases in seismicity occurred in December 1998, May-July 1999, January 2006 (the largest swarm at Martin since it has been monitored, discussed below), and May-June 2007 (figure 1). Figure 1. Number of earthquakes recorded per month at Mount Martin since 1996. Five episodes of increased seismicity are shown, the most notable of which was the January 2006 seismic swarm at Martin. Note the break in scale on the y-axis, denoted by the horizontal dashed line. Modified from Dixon and Power (2009). January 2006 seismic swarm. The January 2006 Mount Martin seismic swarm included 860 locatable earthquakes (figures 1 and 2), more than four times the number of earthquakes seen during other periods of increased seismicity or seismic swarms since the region has been monitored. No recorded earthquakes during the swarm were much greater than M 2 (figure 2d), and a significant number of earthquakes were of magnitudes below the magnitude of completeness, Mc (figure 2a-c). Mc is the minimum magnitude needed to reliably locate an earthquake, reported by Dixon and Power (2009) to be Mc = 0.2 for Mount Martin. Figure 2. Plots highlighting the January 2006 Mount Martin seismic swarm. (A) Number of earthquakes per day; (B) cumulative number of earthquakes; (C) cumulative seismic moment; (D) magnitude of each recorded earthquake. In plots A-C, black symbols indicate all recorded earthquakes, and gray symbols indicate locatable earthquakes (earthquakes with magnitudes equal to or above the magnitude of completeness, M ≥ Mc = 0.2 (explained in text). Dixon and Power (2009) concluded that the pattern of the seismicity of the January 2006 swarm was characteristic of a volcanic earthquake sequence (as opposed to a tectonic earthquake sequence, which begins with a large mainshock) since the located hypocenters of the swarm occurred in the same space as those during previous background periods (figure 3). However, citing the short duration of the swarm, similar focal mechanisms compared to background periods, and the lack of long-period earthquakes, Dixon and Power (2009) stated that the data was not suggestive of a large intrusion of magma beneath Martin. Figure 3.Located earthquake hypocenters at Mount Martin during March 2002-December 2005 (map view shown in A, cross section in B) and during the January 2006 seismic swarm (map view shown in C, cross section in D). The graphs indicate that the hypocenters of the seismic swarm earthquakes occurred within the same volume as those that occurred during previous background period, suggesting that the earthquakes were characteristic of a volcanic earthquake sequence. Modified from Dixon and Power (2009). References. Dixon, J.P., and Power, J.A., 2009, The January 2006 Volcanic-tectonic earthquake swarm at Mount Martin, Alaska, in Haeussler, P.J., and Galloway, J.P., eds, Studies by the U.S. Geological Survey in Alaska, 2007: U.S. Geological Survey Professional Paper 1760-D, 17 p.
Jolly, A.D., McNutt, S.R., 1999, Seismicity at the volcanoes of Katmai National Park, Alaska; July 1995-December 1997, Journal of Volcanology and Geothermal Research, vol. 93, issues 3-4, pg. 173-190 (DOI: 10.1016/S0377-0273(99)00115-8). Neal, C.A., McGimsey, R.G., Dixon, J.P., Manevich, A., and Rybin, A., 2009, 2006 Volcanic Activity in Alaska, Kamchatka, and the Kurile Islands: Summary of Events and Response of the Alaska Volcano Observatory, U.S. Geological Survey Scientific Investigations Report 2008-5214, 102 p.
Information Contacts: Alaska Volcano Observatory (AVO), a cooperative program of a) U.S. Geological Survey (USGS), 4200 University Drive, Anchorage, AK 99508-4667 USA (URL: http://www.avo.alaska.edu/), b) Geophysical Institute, University of Alaska, PO Box 757320, Fairbanks, AK 99775-7320, USA, and c) Alaska Division of Geological & Geophysical Surveys (ADGGS), 794 University Ave., Suite 200, Fairbanks, AK 99709, USA (URL: http://www.dggs.alaska.gov/). On 15 March, the U.S. National Weather Service received a report from the town of King Salmon of steam plumes rising 600-900 m over the general vicinity of Mount Martin volcano in Katmai National Park. No eruptive activity was detected during analysis of satellite imagery. 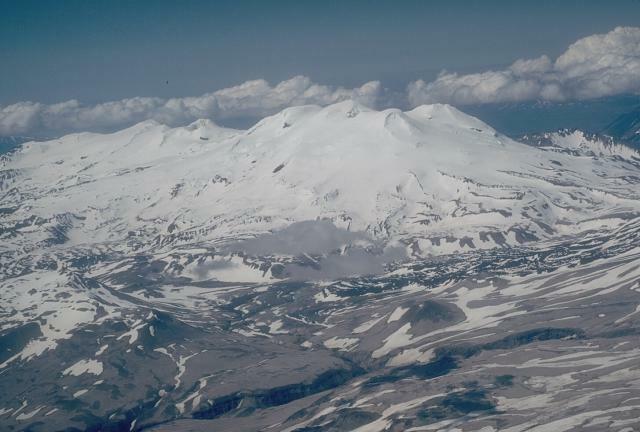 The mostly ice-covered Mount Martin stratovolcano has a poorly documented record of minor historical eruptive activity. However, vigorous steam plumes from its summit crater are common. Information Contacts: Alaska Volcano Observatory. 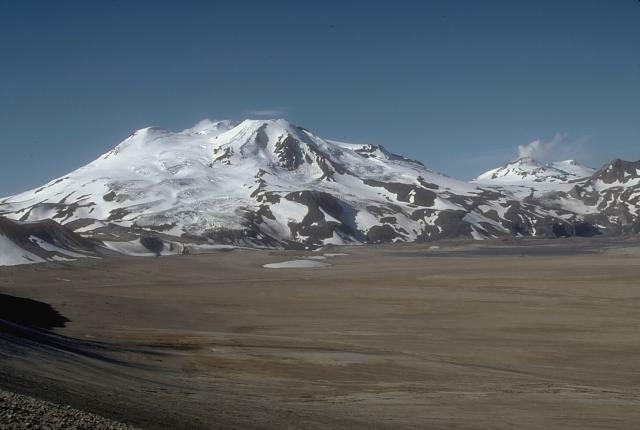 The mostly ice-covered Mount Martin stratovolcano lies at the SW end of the Katmai volcano cluster in Katmai National Park. The volcano was named for George C. Martin, the first person to visit and describe the area after the 1912 eruption. It is capped by a 300-m-wide summit crater, which is ice-free because of an almost-constant steam plume and contains a shallow acidic lake. The edifice overlies glaciated lava flows of the adjacent mid- to late-Pleistocene Alagoshak volcano on the WSW and was constructed entirely during the Holocene. Martin consists of a small fragmental cone that was the source of ten thick overlapping blocky dacitic lava flows, largely uneroded by glaciers, that descend 10 km to the NW, cover 31 km2, and form about 95% of the eruptive volume of the volcano. Two reports of historical eruptions that originated from uncertain sources were attributed by Muller et al. (1954) to Martin. Fierstein J, 2007. Explosive eruptive record in the Katmai region, Alaska Peninsula: an overview. Bull Volcanol, 69: 469-509. Hildreth W, Fierstein J, 2000. Katmai volcanic cluster and the great eruption of 1912. Geol Soc Amer Bull, 112: 1594-1620. Hildreth W, Fierstein J, Lanphere M A, Siems D F, 1999. Alogogshak volcano: a Pleistocene andesite-dacite stratovolcano in Katmai National Park. In: Kelly K D (ed), Geologic Studies in Alaska by the U. S. Geological Survey, 1997 U S Geol Surv Prof Pap, 1614: 105-113. Hildreth W, Lanphere M A, Fierstein J, 2003. Geochronology and eruptive history of the Katmai volcanic cluster, Alaska Peninsula. Earth Planet Sci Lett, 214: 93-114. Keller A S, Reiser H N, 1959. Geology of the Mt. Katmai Area, Alaska.. U S Geol Surv Bull, 1058-G: 264-268. Remarks: A deformation signal near Martin, Mageik, and Trident volcanoes has been observed with InSAR. There is a gap in InSAR data coverage between 2000 and 2004, but the uplift is likely continuous. There is no Emissions History data available for Martin. Mount Mageik is the broad stratovolcano at the center of this aerial view from the east, south of Katmai Pass. Martin volcano forms the skyline left of Mageik, and lava flows on the flanks of Trident volcano are visible at the middle right. The three volcanoes are part of a NE-SW volcanic chain cutting across Katmai National Park. Much of the surface of Mageik volcano is formed by lava flows of Holocene age. Historical reports of eruptions from both Mageik and Martin are of variable reliability. Photo by Christina Neal, 1990 (U.S. Geological Survey, Alaska Volcano Observatory). Mount Mageik (left) and steaming Mount Martin (distant right) tower above the flat-bottomed floor of the Valley of Ten Thousand Smokes (VTTS). The VTTS was formed by ash flows during the 1912 eruption of Novarupta volcano, the Earth's largest eruption of the 20th century. Glacier-clad Mount Mageik has a broad summit capped by 4 knobs, each of which is a spatter and lava-flow vent. Photo by Game McGimsey (U.S. Geological Survey, Alaska Volcano Observatory). Mount Martin is large, glacier-covered stratovolcano at the southern end of the group of volcanoes in the Katmai area. 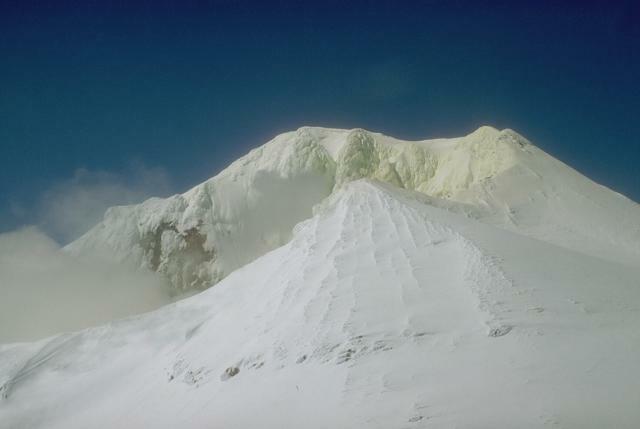 Steam rises from the summit crater and sulfur stains the snow and ice in this 1990 view. The crater, which is breached to east, is the site of intense fumarolic activity and sometimes contains a small crater lake. The volcano was named for George C. Martin, the first person to visit and describe the Katmai area after the 1912 eruption. There are no samples for Martin in the Smithsonian's NMNH Department of Mineral Sciences Rock and Ore collection. Large Eruptions of Martin Information about large Quaternary eruptions (VEI >= 4) is cataloged in the Large Magnitude Explosive Volcanic Eruptions (LaMEVE) database of the Volcano Global Risk Identification and Analysis Project (VOGRIPA).